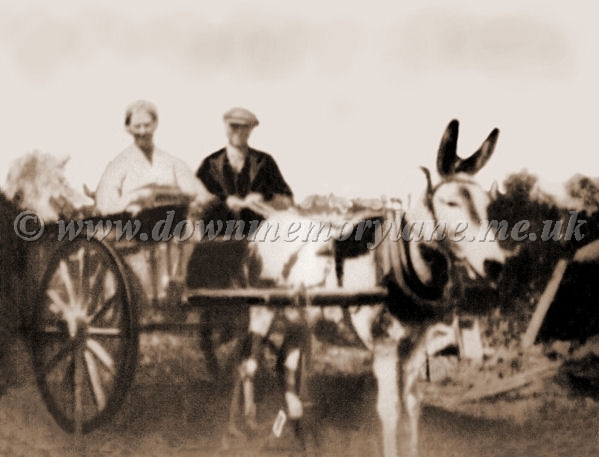 These are the Baston's who lived in Magherafelt around Lough Neagh in 1863, yes this photograph was taken 150 years ago no wonder it is slightly blurred. Now Paddy Baston who originally came from Scotland was a fisherman and his wife Mary Baston nee McCartney came from Ballymaguigan which is a hamlet and town land in County Londonderry. It is near the northwest shore of Lough Neagh and close to Magherafelt. This where Paddy did his fishing on Lough Neagh catching brown Trout, Dollaghan and Pollan a white fish. Here they are at what must be one of their stopping spots for the locals to come and buy their fish and by the empty boxes behind the donkey they seem to be doing very well.